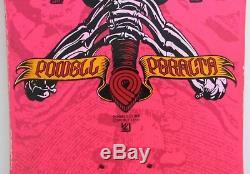 Vintage (1980) Powell Peralta "Skull and Sword" Skateboard Deck - Hot Pink - NOS. 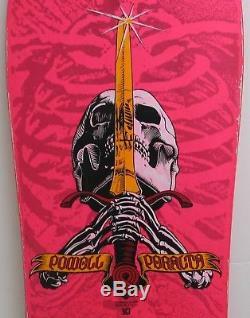 This is a Vintage (1980) Powell Peralta "Skull and Sword" Skateboard Deck in the Hot Pink color. 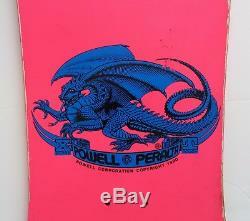 The Top Deck has a Hot Pink Color, a Solid Background and a Blue Dragon Powell Peralta Logo and the following Text... 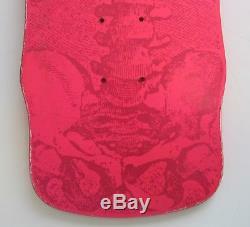 The Bottom Deck has a Hot Pink Color, a Skeleton Background and a Multi Color Skull and Sword Powell Peralta Logo. It is New Old Stock (NOS). 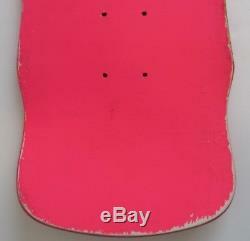 It has never been Grip Taped, Mounted with Trucks or Used. It has some Wear from Age and Storage. It is in Good Condition. (Please see Pictures for exact condition). 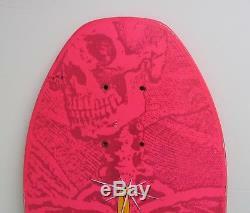 The item "Vintage 1980 Powell Peralta Skull And Sword Skateboard Deck Hot Pink NOS Skater" is in sale since Tuesday, December 12, 2017. 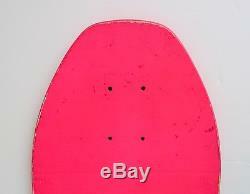 This item is in the category "Sporting Goods\Outdoor Sports\Skateboarding & Longboarding\Vintage".com" and is located in San Diego, California. This item can be shipped worldwide.